aeinews.org » Blog Archive » Mass whale stranding during Italian Navy exercises: sonar heard? You may already have seen the report by colleague Dr. Frantzis a few hours ago, posted on the ECS-Talk discussion list (below), describing the atypical mass stranding of a minimum of three Cuvier’s beaked whales, Ziphius cavirostris, which occurred yesterday, 30 November 2011, on the western shores of the Greek island of Corfu. Based on this very preliminary information it is still impossible to tell whether the stranding event was caused by human activities. However, on the basis of the report there appears to be strong evidence that human noise from an unknown source, similar to sound known to cause atypical beaked whale mass strandings, was generated in the location’s marine waters as the strandings were occurring. 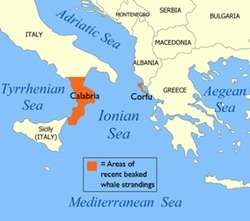 Based on recommendations from the ACCOBAMS Scientific Committee, the waters of the eastern Ionian Sea (where the above mentioned strandings of Cuvier’s beaked whales have occurred) were listed in MOP Resolution 3.22 (“Marine Protected Areas for cetaceans”) as “areas of special importance for the common dolphin and other cetaceans”. The deep marine waters off NW Greece and S Albania are widely known to contain important, possibly critical habitat of Cuvier’s beaked whales, as also suggested from the modeling exercise performed by Dr. Ana Cañadas, requested by the Scientific Committee of ACCOBAMS and presented to the Committee’s 7th Meeting in Monaco (March 2011)(see map of predicted relative density of animals, 1990-2010, in Dr. Cañadas’ report). In that occasion the Meeting agreed that beaked whales should not be exposed to a Sound Pressure Level greater than 140 dB re 1 ?Pa @ 1 m throughout most of Mediterranean waters deeper than 600 m.
Based on the above I cannot avoid considering the production of high level noise in the waters off western Corfu a deliberate take of Cuvier’s beaked whales, a protected species. Furthermore, Resolution 4.17 contains in its Annex Guidelines “to address the impact of anthropogenic noise on cetaceans in the ACCOBAMS area”, with explicit indication of measures to be adopted to avoid that events such as yesterday’s Corfu atypical mass stranding of Cuvier’s beaked whales will occur. These include 19 specific guidelines of actions to be followed during the course of seismic surveys and airgun uses. Since I am unaware whether most of the above Resolution commitments, recommendations and prescriptions were implemented, while I am aware that Cuvier’s beaked whales continue to be subject to episodes of atypical mass strandings in the ACCOBAMS area – with the Corfu event being only the last known – I am kindly asking you to inform me and the science and conservation community in the Mediterranean at large about what measures the Parties – with the support of the Secretariat – intend to implement, amongst those that the Parties have agreed upon in the above mentioned Resolutions, so that the illegal takes of a species protected by many international (e.g., ACCOBAMS, CMS, Bern Convention, EU Habitats Directive, SPA-BD Protocol to the Barcelona Convention) and national legal instruments be avoided in the future. In particular, I think that it would be important to know whether the Secretariat or the Parties most concerned by the specific Corfu event (i.e., Albania, Greece and Italy) are informed about the occurrence of noise-producing human activities in the area, and if yes whether an EIA for such activity exists, whether you have seen such EIA, on what scientific bases the EIA was produced and approved by the competent authorities, whether there were Marine Mammal Observers on board, whether the EIA was brought to the attention of the Scientific Committee of ACCOBAMS, or whether the EIA was evaluated by cetacean bioacoustic experts. Given our extreme concern for the continued existence of Cuvier’s beaked whales in the Mediterranean Sea, I look forward to your feedback on my questions above, and take this opportunity for sending you my best regards. Following the recent letter from Dr. Notarbartolo di Sciara and the information provided by Dr. Frantzis and Prof. Bruno Cozzi about the recent mass stranding of three Cuvier’s beaked whales in Corfu and other two whales in the Ionian Coast of Calabria. I would like to express my concern about these events and to kindly suggest some important measures to establish potential causes of death and prevent new mortalities. As you know there have been several mass strandings in Spain that have been related to the use of military sonar. The latest event occurred in the coast of Almeria (SE Spain) and the veterinary team of the University of Las Palmas de Gran Canaria identified findings in the necropsy similar to those in beaked whales stranded in Canary Islands in temporal and spatial coincidence with naval exercises. Only strong dedication from different parties finally got information on the co-occurrence of naval exercises using tactic sonar with the mass stranding event in Almeria. This indicates that it is of maximum importance to obtain information on the acoustic activities occurring in the Ionian Sea that have the potential to be related with the recent Corfu-Calabria strandings. ACCOBAMS seems to be ideally positioned to take the lead on the process of requesting this information from the parties. Spatial mitigation has been identified a one of the most effective ways of reducing impact, i.e. avoiding known important habitats for sensitive species when planning an activity with serious potential impact. As you know beaked whales seem to be highly vulnerable to naval sonar and the effectiveness of spatial mitigation has been proven in different places. An example is the Canary Islands: after a historical record of coincidences between naval exercises and atypical beaked whale mass strandings in the Archipelago, there have been no more of these events since the moratoria to the use of sonar within 50 nm of the Canary Islands was declared in 2004. It may be an important effort, but worthy to pursue, to initiate a process to request spatial mitigation measures in areas of known important areas of distribution of beaked whales in the Mediterranean, to guarantee the sustainability of the populations. Again, ACCOBAMS seems to be very well positioned to initiate this process and this initiative would count with serious scientific support. I am in rather desperate need of information to oppose a naval request for sonar surveillance work to be conducted in the Indian Ocean. This will involve the use of 2 105 in3 air guns on the Scripps Institutes RV Melville to be conducted Jan-Feb. The comment period ends dec. 21 so time is of essence. I submitted my objections to a similar project which was conducted between the Hawaian Islands and Midway, this was in Sept. I noticed that Jack Caldwell is another authority in this field but has not published anything since 2002. Sounds like you may be talking about a geophysical research project (airguns imaging geology below the sea floor), rather than a sonar mission (Scripps doesn’t do surveillance for sure, and probably no mid-frequency active sonar at all unless perhaps occasionally as part of controlled exposure experiments, which, while controversial for many, use quite moderate levels and are very carefully monitored).